As Iranians prepare to elect a new president, the country’s international image is largely negative. Majorities in most of 39 countries surveyed have an unfavorable opinion of Iran, and most say Tehran does not respect the personal freedoms of its people. Meanwhile, any nuclear ambitions harbored by the Iranian government continue to draw strong opposition from Western countries, as well as neighboring states in the Middle East. Unfavorable views of Iran are especially widespread in Israel and much of Western Europe, where at least eight-in-ten in most countries surveyed have a negative opinion of Iran. In the U.S., roughly seven-in-ten express an unfavorable view of Iran. Majorities in many predominantly Muslim nations surveyed also see Iran in a negative light, including countries such as Jordan (81% unfavorable), Egypt (78%), Turkey (68%), Lebanon (60%) and the Palestinian territories (55%). Only in Pakistan (69%) and Indonesia (55%) do majorities express a favorable opinion of Iran. Iran’s poor reputation for protecting personal freedoms does not help its international image. Majorities in 24 of 39 countries surveyed think Tehran does not respect the rights of its citizens. This includes three-quarters or more who hold this view in Europe and North America, as well as in Israel, Brazil, Australia and South Korea. Assessments of Tehran’s rights record are less black-and-white in the other countries surveyed, with opinion divided in Russia (24% Iran respects personal freedoms, 42% does not respect) and China (33% vs. 37%). 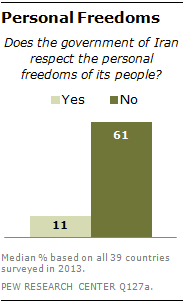 Only in Pakistan does a clear majority (57%) say Iran respects the personal liberties of its citizens. Concern about Iran’s nuclear ambitions may be another factor contributing to its widely negative image. Across the E3+3 countries – the U.S., Britain, France, Germany, Russia and China – which are involved in on-again, off-again nuclear talks with Tehran, at least six-in-ten oppose Iran acquiring nuclear weapons. 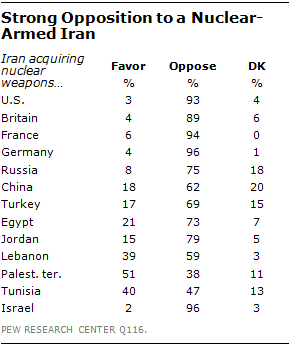 In the Middle East, Israelis are nearly unanimous (96%) in their opposition to Tehran developing nuclear weapons. But some Muslim publics in the region also voice strong objections to a nuclear-armed Iran, including roughly six-in-ten or more in Jordan (79%), Egypt (73%), Turkey (69%), and Lebanon (59%). These are among the key findings of a new survey by the Pew Research Center conducted in 39 nations from March 2 to May 1, 2013. The poll also finds that, despite broad opposition to Iran obtaining nuclear weapons, key publics continue to disagree on policy toward Tehran. Among the E3+3 countries, for instance, at least seven-in-ten among those who oppose Iran’s nuclear program in the U.S., Britain, France and Germany back tougher economic sanctions, but the Russians and Chinese are divided on the issue. Meanwhile, only in the U.S. and France are clear majorities of people who oppose a nuclear armed Iran willing to support military action in order to prevent Iran from obtaining nuclear arms. The survey additionally finds that publics in the Middle East vary in their assessment of Iran’s regional influence. The vast majority of Lebanese (85%), for example, see Iran as influential in their country. But the Palestinians offer a mixed assessment of Iran’s power, and solid majorities in Turkey, Egypt, Jordan and Tunisia say Iran has little or no influence in their respective countries. Iran’s image is overwhelmingly negative across much of the world. Unfavorable opinions of Iran are especially pronounced in Europe, with majorities ranging from 88% in France to 59% in Britain saying they have a negative opinion of Iran. Russia is the one outlier in the region, with only a 49%-plurality expressing an unfavorable view of Iran. In North America, about seven-in-ten in the U.S. (69%) and Canada (70%) have an unfavorable opinion of Iran. To the south, most countries surveyed in Latin America share this negative assessment of Iran, including at least half in Brazil (72%), Chile (55%), Mexico (52%) and Venezuela (51%). Across the Middle East and North Africa, the prevailing opinion of Iran is also negative. In Israel, roughly nine-in-ten (92%) express an unfavorable view of Iran, while about eight-in-ten share this opinion in Jordan (81%) and Egypt (78%). Tunisia is the one country surveyed in the region where fewer than half (44%) view Iran unfavorably. It should also be noted that, although overall Lebanese opinion of Iran is negative, only 11% of Lebanese Shia share this view (89% are favorable toward Iran). In sub-Saharan Africa, attitudes toward Iran are mixed, with many respondents offering no definite opinion. The one exception is South Africa, where a 57%-majority expresses a negative view of Iran. The Asia-Pacific region is home to the only countries surveyed where clear majorities have a favorable opinion of Iran: Pakistan (69%) and Indonesia (55%). 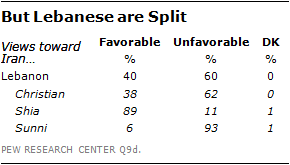 Elsewhere in the region, attitudes clearly lean in the opposite direction, with at least six-in-ten in Japan (75%), Australia (68%), Philippines (60%), South Korea (59%) and China (58%) holding an unfavorable opinion of Iran. Compared with six years ago, unfavorable views of Iran have intensified in a number of countries. This is especially the case in the neighboring states of Egypt and Jordan, where negative opinion of Iran increased by 28 percentages points in each country between 2007 and 2013. Over the past half dozen years, unfavorable opinion of Iran has also increased in the Palestinian territories (+16 percentage points), South Korea (+16), Turkey (+12), Spain (+12), and Russia (+9). Pluralities to majorities in 28 of 39 countries surveyed say the government of Iran does not respect the personal freedoms of its people, a finding that follows well-publicized crackdowns on opposition leaders and other groups since President Ahmadinejad was returned to office in a controversial 2009 election. Criticism of Tehran’s rights record is most pronounced in Europe, the U.S. and Canada, where at least three-quarters of those surveyed say Iran does not respect the personal freedoms of its citizens. In Latin America, half or more in all seven countries surveyed agree that the government in Tehran does not observe or protect the rights of Iranians, including 82% in Brazil who take this view. Majorities in most nations surveyed in the Middle East and North Africa are also skeptical of Iran’s rights record, with roughly nine-in-ten Israelis (91%) saying Tehran does not respect the rights of citizens, and at least six-in-ten agreeing in Egypt (66%), Jordan (61%) and Lebanon (61%). Relatively few in sub-Saharan Africa take a strong stand on Iran’s observance of personal liberties, with opinion closely divided in most of the countries surveyed and many saying they don’t know. Assessments of Iran’s rights record vary in the Asia-Pacific region. Clear majorities in some countries think Tehran does not respect personal freedoms, including Australia (81%), South Korea (75%), Japan (69%) and Philippines (59%). But opinion is mixed in China (33% does respect; 37% does not), as well as predominantly Muslim nations of Indonesia (44%; 35%) and Malaysia (37%; 29%). Pakistan is the one country surveyed where a majority (57%) says that Tehran does respect the rights of its citizens. Publics in the Middle East and North Africa differ about the degree to which Iran’s influence extends beyond its borders. Lebanon, where Tehran-backed Hezbollah is a major political and military force, is the only country surveyed in which an overwhelming majority (85%) thinks Iran has either a fair amount or great deal of influence in domestic affairs. Majorities among each of Lebanon’s main religious groups agree that Iran wields considerable influence in their country, with Sunnis and Christians most likely to say Iran has a great deal of influence (65% and 63%, respectively), compared with 44% of Shia who say the same. Palestinians are divided on whether Iran’s reach extends to their internal affairs: 48% say Iran does exert influence in their affairs, while 43% say it wields little or no influence. By comparison, majorities in Jordan (66%), Turkey (60%), Tunisia (61%) and Egypt (56%) characterize Iran as having not very much or no influence in their countries. On balance, those who believe Iran has substantial influence tend to describe this as a bad thing. More than two-thirds of people who say Iran has a great deal or fair amount of influence take this view in Turkey (73%) and Tunisia (69%), as do majorities in Lebanon (58%) and Jordan (57%). Pluralities in Egypt (44%) and the Palestinian territories (47%) also consider Iran playing a role in their domestic affairs to be a bad thing. Opinion in Lebanon divides along sectarian lines: 87% of Shia who think Iran is having a major influence see it in a positive light, in contrast with 91% of Sunnis and 62% of Christians who consider Tehran’s reach into Lebanon a bad thing. International opinion is clearly against Iran acquiring nuclear weapons. Majorities in most countries where the question was asked say they oppose a nuclear-armed Iran, including at least six-in-ten in each of the E3+3 countries: Germany (96%), France (94%), U.S. (93%), Britain (89%), Russia (75%) and China (62%). In the Middle East and North Africa, Israelis are the most vocal opponents of Iran acquiring nuclear weapons (96% opposed). But they are not the only concerned public in the region. Strong majorities in Jordan (79%), Egypt (73%), Turkey (69%) and Lebanon (59%) also oppose Iran developing a nuclear arsenal. By comparison, opinion is divided in Tunisia (40% favor, 47% oppose), while Palestinians are the only public surveyed where as many as half (51%) support Tehran acquiring nuclear weapons. Attitudes in most E3+3 countries have changed little since last year except in China where the public is more opposed to a nuclear-armed Iran than in 2012 (62% vs. 54%). 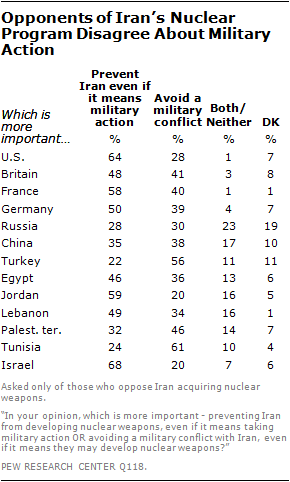 Publics differ when it comes to the use of economic sanctions to prevent Iran from acquiring nuclear arms. Roughly three-quarters or more of those who oppose Iran’s nuclear program in the U.S. (78%), Germany (77%), Britain (75%) and France (73%) approve of tougher economic sanctions to deter Iran from developing nuclear weapons. But only 47% share this view in Russia, while the Chinese are divided on the question (44% favor; 47% oppose). Among Iran’s regional neighbors, there is a similar lack of consensus about strengthening the economic sanctions aimed at Tehran. Solid majorities of those who oppose the Iranian nuclear program in Israel (91%), Egypt (61%), Jordan (74%) and Lebanon (77%) favor a tougher sanctions regime as a means of reigning in Iran’s nuclear ambitions. But majorities in Turkey (66%) and the Palestinian territories (55%) oppose such a strategy. Opinion in Tunisia is divided – 42% favor, while 48% oppose tougher sanctions. There is deeper disagreement about possible military action to prevent Iran from acquiring nuclear weapons. On this question, there are even different levels of support among the U.S. and its western European allies. Among opponents of Iran’s nuclear program, about two-thirds (64%) in the U.S. and 58% in France would support military action if necessary, but only 50% in Germany and 48% in Britain say the same. Just 28% in Russia and 35% in China back a military option. Among those who do not want to see a nuclear armed Iran in the Middle East and North Africa, solid majorities in Israel (68%) and Jordan (59%) say it is important to keep Iran from developing nuclear weapons even if it means military action. A plurality holds this view in Lebanon (49%) and Egypt (46%). However, such an option is opposed by 61% in Tunisia, 56% in Turkey, and 46% in the Palestinian territories.